Holiday Greetings to all So Cal Flame Surfers! A reminder that our Holiday Bash meeting is this Saturday December 9. We will be meeting at Pacific Art Glass in Gardena, from 9:30 – 1:00. The largest raffle and silent auction of the year. Our raffle has 20 prizes, including the grand prize of a 10 Liter oxygen concentrator! Over $1,000 worth of prizes can be had for your $1 raffle tickets. In addition, we will be having a special Silent Auction that will include this beautiful flower compression pendant from John Kobuki. The auction will also include specialty glass and assortments of enamels. Here are the details of the meeting – hope you can join us. Thanks to John Williams and the staff for hosting this event and giving SCFS a home this past year. As always, our holiday meeting will be a special event, with a special demonstration on marbles, gift bag for members, expanded raffle, silent auction, pot luck, gift exchange, and plenty of opportunity for conversation. Admission is $10 for non-members. Demo. I’m excited to have Derek White, one of the leading glass pipe artists in Southern California, give us a demonstration on marble making at our meeting. Derek has been a leader in developing new artistic themes in pipes and also specializes in implosion techniques for making marbles, such as the face design shown here. Derek is a resident artist at Goose Fire Glass Center. Come and learn some new techniques that you can incorporate into either soft glass or boro; and also get insider information on the past, present, and future of “functional glass”. Raffle and Silent Auction. The holiday raffle will be the biggest of the year! There will be a large number of prizes, including tools, glass, and gift certificates. Grand prize will be a 10- liter concentrator! We will also have a silent auction, where you can bid on individual items, including specialty glass and sets of enamels. Glass Gift Exchange. Please bring a wrapped flame worked bead or sculptural item for the holiday gift exchange. It would be great for all members to participate. All skill levels and themes are welcome. This is a great opportunity to get a unique item from one of our talented members. Pot Luck. Please bring a warm or cold food item to share while you socialize during the event. We will provide drinks and utensils. 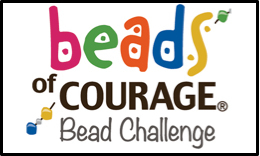 Beads of Courage Donation. Please keep the donations coming. Courage beads, those with a special theme, size, texture, or sculptural element are especially needed, so that patients can document significant events in their treatment. BOC ran out of courage beads in September and there are never enough of these beads to satisfy the need. There are two suggested themes for your beads for this meeting: holidays and birthdays. The hospitals use beads to mark seasonal holiday events, such as Christmas, so beads featuring snowmen (or women), Christmas trees, stars, and ornaments would be great. Also, the hospitals need cupcakes to recognize birthdays. I’ve seen some great cupcakes donated in the past, and hope to see more at the next meeting. I will be hand delivering some of the holiday beads directly to CHOC to make sure they will get used this year. Here is a fun and easy snowman tutorial for holiday bead inspiration. Use your imagination and skill to embellish with fun hats or extra fashion style. You can download the tutorial by clicking on the snowman image to the right. These tutorials are made possible by the generosity of Diane Woodall and Soda Lime Times www.sodalimetimes.com. Soda Lime Times is a great monthly publication for all types of flame workers and is also a major supporter of Beads of Courage. I encourage you to check out this publication, I’m sure you will find it engaging and valuable.